FAIRHAVEN, Mass. (Jan. 22, 2019) – Scotty Cameron has created his most technically advanced putter line to date with the 2019 Phantom X family – a collection of nine new modern mallets engineered to take putting performance to the next level. The Phantom X line presents players with a variety of new mallet setups built around a cohesive mix of five head styles, with multiple shaft bend and alignment options. 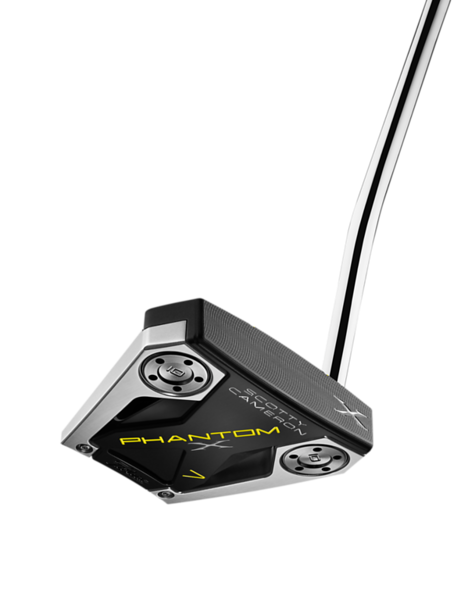 To maximizeMOI, each Phantom X model incorporates multi-material construction featuring precision milled solid aluminum faces integrated with 303 stainless steel heads with enhanced vibration dampening technology. 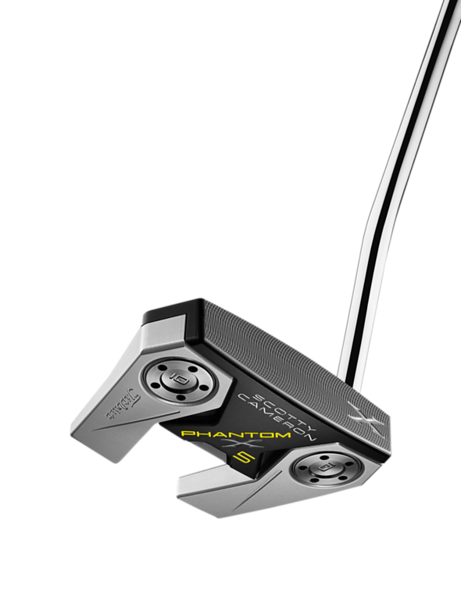 Available in golf shops worldwide beginning April 5, Phantom X replaces the Futura family while advancing Titleist Master Putter Maker Scotty Cameron’s proven multi-material construction methodology of combining 303 stainless steel and 6061 aircraft-grade aluminum for increased MOI, optimal weight distribution, improved sound and responsive feedback. 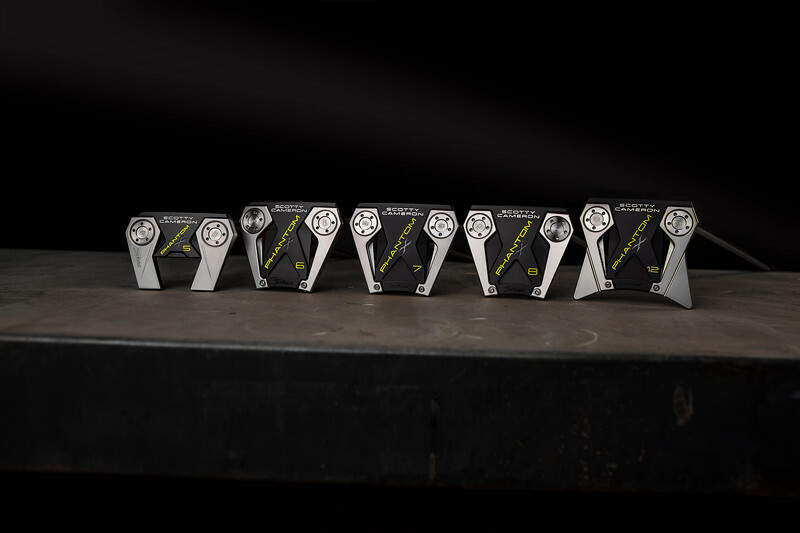 FIVE NEW HIGH-TECH, MULTI-MATERIAL HEADS: Each Phantom X putter is a precision milled, multi-component mallet based on one of five new head designs. These models are slightly more compact than their Futura predecessors with sleek, ground-hugging contours that pleasingly angle away from the player to inspire confidence at address, yet still employ aluminum and steel components perfectly matched for optimal shape and weight distribution. TOUR PREFERRED ALIGNMENT: A variety of tour-preferred setups offer multiple alignment options, including: continuous lines from the leading edge all the way back; simple sight dots; raised or stepped down flanges; and wider or “vanishing” toplines. 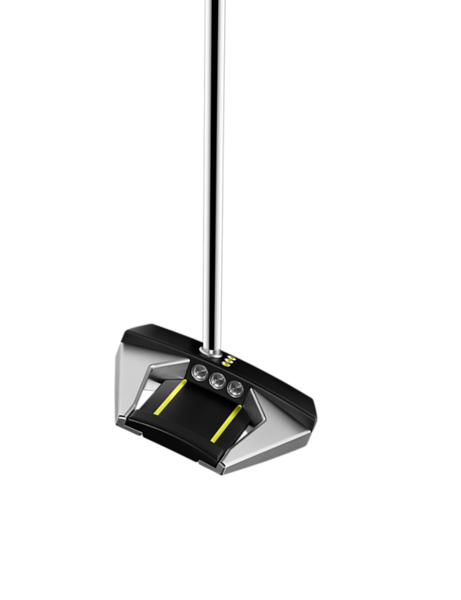 Alignment features have been accentuated with longer, racing-inspired lines and triple milled sight dots highlighted in neon yellow paint to frame the golf ball at address. 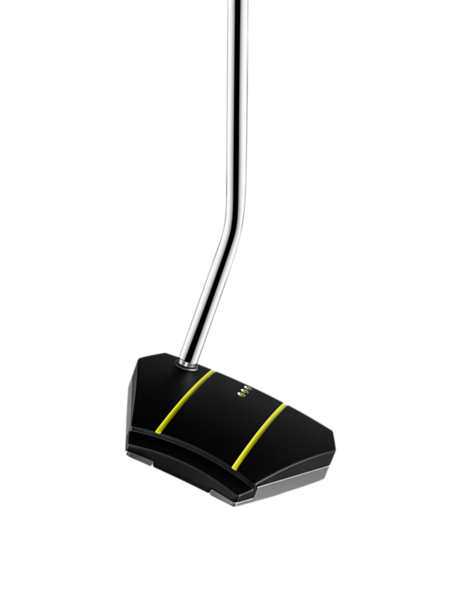 MULTIPLE SHAFT BEND OPTIONS: With three shaft options – low-bend, mid-bend and straight – offered across the Phantom X line, players have more choices with regard to their preferred amount of toe flow. 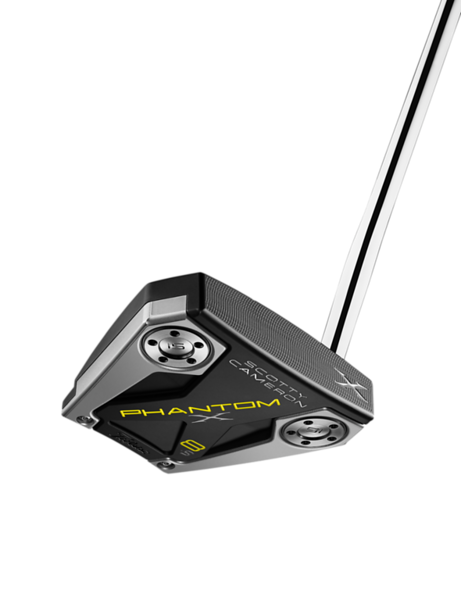 Phantom X models with “.5” in the name (i.e., 5.5,7.5 and 8.5) have a shorter, low-bend shaft configuration with one shaft of offset for more toe flow to promote an arc in the putting stroke. 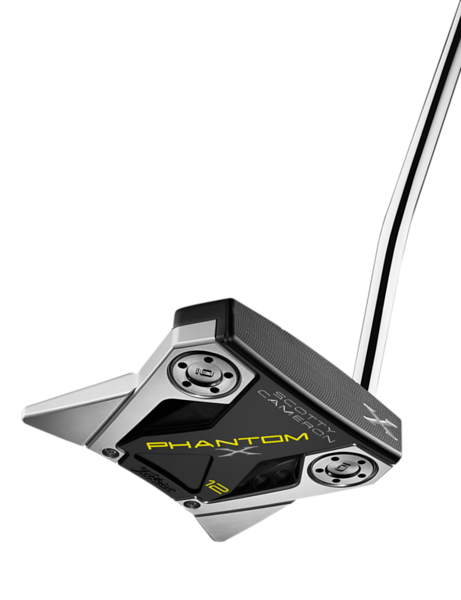 The Phantom X 5, 6, 7, 8 and 12models have a slightly taller, mid-bend shaft for a near-face balanced setup that produces less toe flow than the .5 models. 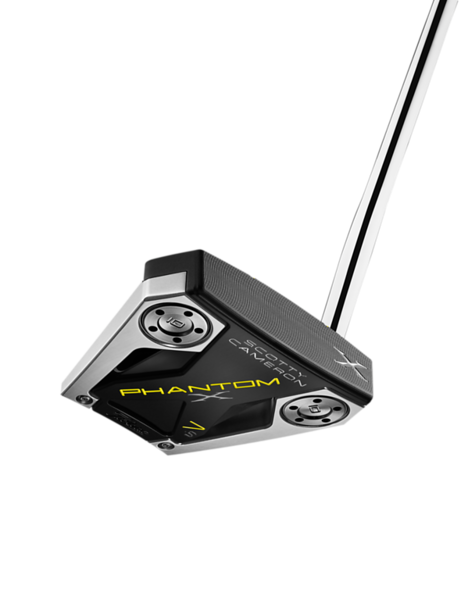 The Phantom X 6STR has a straight shaft with zero offset. SOLID FACE TECHNOLOGY: Each Phantom X mallet is constructed with a standard-milled, 6061 aircraft aluminum face anodized black that extends back and through the flange areas of each model. This results in solid feedback, while preserving the soft feel players prefer. NEW CUSTOM DESIGNED GRIP: The Phantom X line marks the debut of the newPistolero Plus grip in cement gray with gloss black paintfill. The Pistolero Plus is a modified Pistolero grip with a thicker, less tapered right (low) hand that combines the tour-preferred performance and feel of a rubber Pistolero-style grip with a slightly built-up feel perfectly suited to mallet putters. • Phantom X 5: The evolution of this Tour-proven wingback mallet with a single mid-bend shaft continues with a solid aluminum face anodized in black that extends back into the stepped down flange, framed by misted stainless steel. 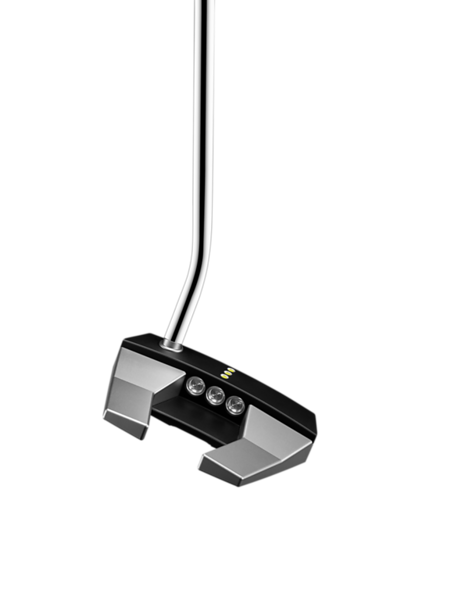 Three milled topline sight dots painted neon yellow and framed with polished aluminum provide simple but effective alignment to the sweet spot. • Phantom X 5.5: Identical in shape to the Phantom X 5, the 5.5 has a lower shaft bend that provides enhanced toe flow for players seeking stability while still creating an arc in the stroke. This bend was inspired by Justin Thomas’ Tour prototype setup and combines some of the feel of a blade putter with the forgiveness benefits of a mallet. • Phantom X 6: A face balanced mallet with a single mid-bend shaft provides distinct alignment cues, with two long neon yellow sight lines milled into the stepped down flange, framing three milled sight dots on the misted black anodized topline. Customizable sole weights increase MOI and stability through the stroke. 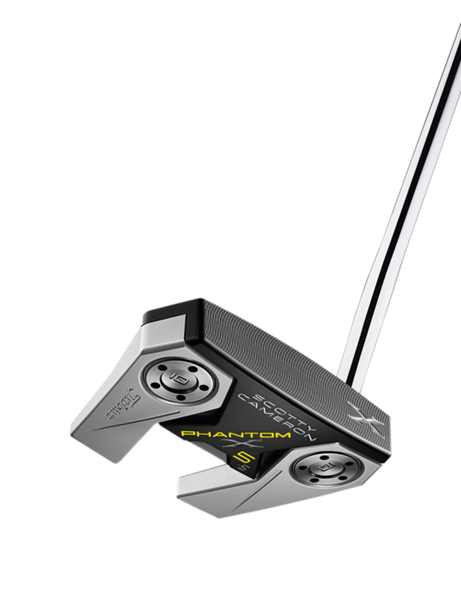 • Phantom X 6STR: Constructed without a spud and with zero offset, the straight shafted 6STR produces face balanced performance with a clean and minimalist look at address. The topline sight dots of the Phantom X 6STR are painted neon yellow for easy alignment in conjunction with the extended neon yellow sight lines in the stepped down flange. • Phantom X 7: A single mid-bend-shafted, near-face balanced setup, Phantom X7 features a heel-to-toe tapered aluminum face that is sculpted into a raised center flange for a continuous, connected surface from the leading edge all the way back.Framed by stepped down, angular stainless steel components, the Phantom X7 combines the benefits of long flange sight lines with a semi-traditional topline for easy horizontal and vertical alignment at setup. Also available in a left-handed model. 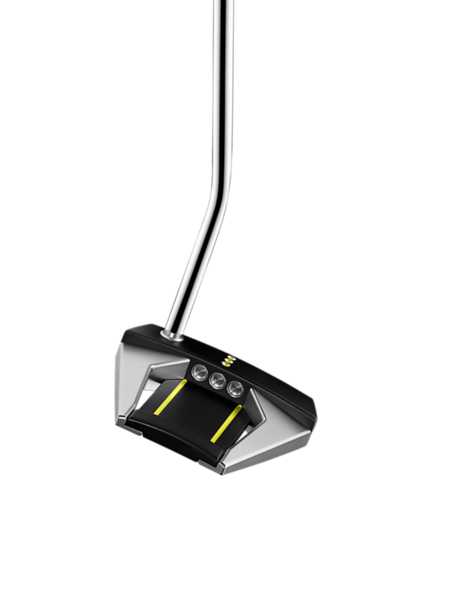 • Phantom X 7.5: With a single low-bend shaft crafted to promote enhanced toe flow with forgiveness, the Phantom X 7.5 employs a raised center flange offering a continuous, connected surface accented with neon yellow alignment cues from the leading edge through the back flange. Also available in a left-handed model. 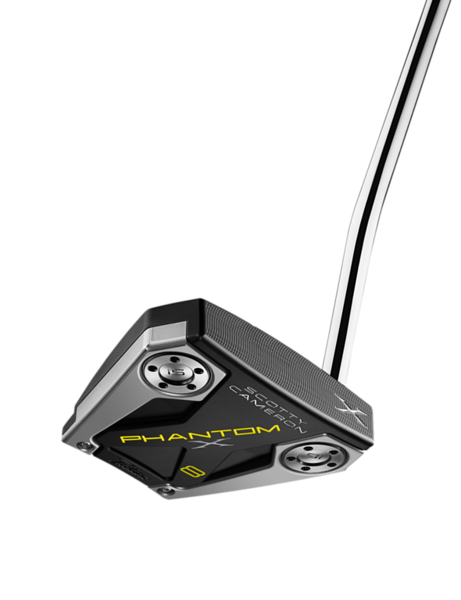 • Phantom X 8: Inspired by touring professionals seeking a putter with simple visual cues and a continuous transition from leading edge through the back flange, thePhantom X 8 is a sleek, near-face balanced mallet with a single mid-bend shaft. Milled sight dots and neon yellow sight lines perfectly frame the golf ball for seamless alignment without distractions. 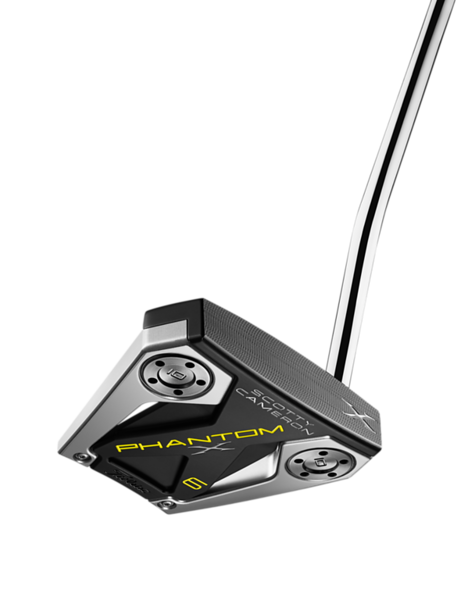 • Phantom X 8.5: Differing from the Phantom X 8 only in shaft bend length and increased toe hang, the Phantom X 8.5 offers players an unbroken, sculpted flange from the putter’s leading edge through the back flange with a single low-bend shaft top promote a slightly arced putting stroke. Alignment is easy with bright visual cues. 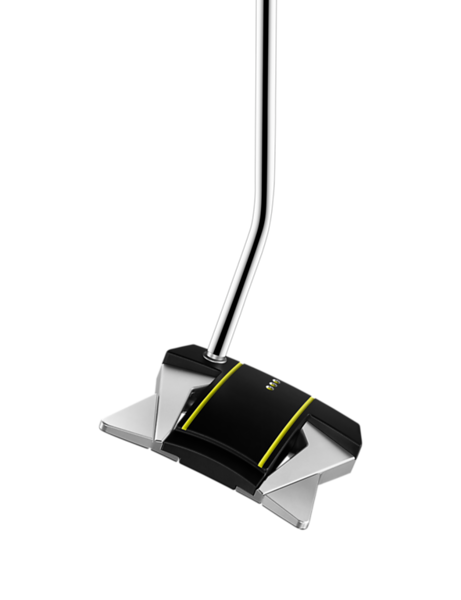 • Phantom X 12: With swept-back wings precision milled from 303 stainless steel, this near-face balanced, high-MOI mallet with a single mid-bend shaft employs the continuous alignment features of the Phantom X line’s full leading-edge-to-flange construction – crafted from aircraft grade aluminum, anodized black and accented with neon yellow sight cues. The ultimate in technology, stability and forgiveness. 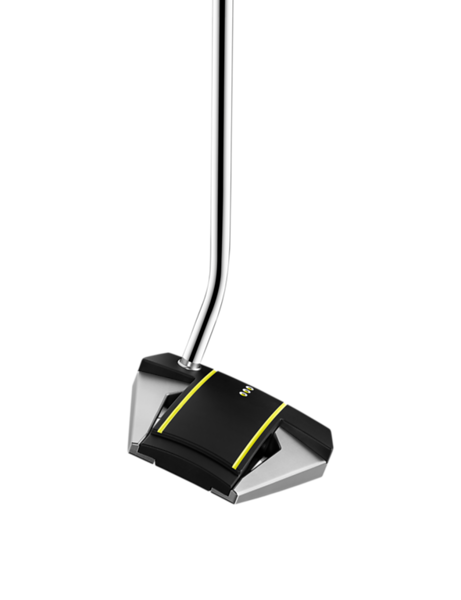 PHANTOM X WEIGHTING & SHAFTS: Each new Phantom X putter features advanced stability weighting with two, customizable stainless steel heel-toe weights and stepless steel shafts. FINISH & GRAPHICS: The Phantom X line’s 6061 aircraft grade aluminum components have been anodized black in a misted finish that helps to reduce sun glare. 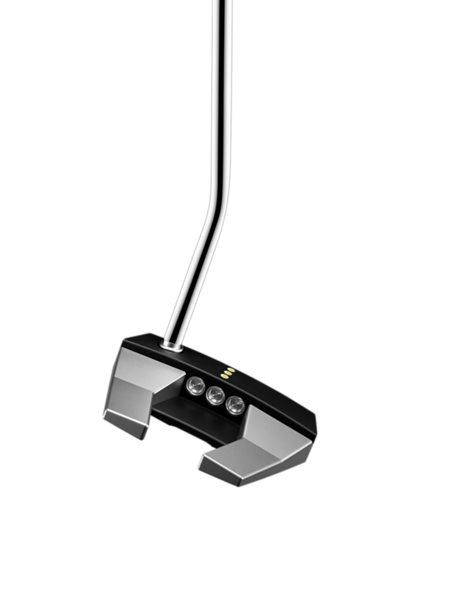 The 303 stainless steel putter head components have also been misted for a radiant yet glare resistant appearance.Scotty’s familiar three-dot theme carries through to the back cavities of the Phantom X 5, 5.5,6 and 6STR as unpainted, raw circles revealed by milling away the black anodization. Neon yellow paintfill provides bold visual guidance in sight lines, while sight dots have been double-milled to highlight the neon yellow paintfill with a ring of silver-colored aluminum. AVAILABILITY: Phantom X putters will be available worldwide on April 5, 2019, through Titleist authorized golf shops. MAP $429. 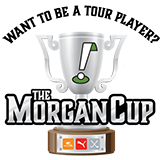 I like the looks and that the are replacing the futura line. For some reason though, the name and colors don't scream SC to me, even though I love how they look. Could maybe do a 5, but not to keen on the rest of the lineup. I will just stick to the Scotty I have. Surprise, surprise, love the looks of the X 5.5. Not really my cup of tea, I prefer a classic mallet shape or a wing shape more like the Odyssey 7, thought the 5's there aren't too bad. I would certainly try it, but I don't think that this is something that I could see myself purchasing. Some very.... "industry inspired" profiles in there. I think they will sell well. Different for Cameron but I agree, they will sell like everything else he offers! Are the Tour players using these type busy looking Cameron putters ? I know Scotty Cameron spends a significant amount of his time doing Tour-related work, and he credits much of his success for acceptance of his brand by Tour players. But Tiger, Fowler, and several other Tour players use older style single piece of steel (no, insert, no weights) Newport style putters, and I think Cameron's stock line should include at least one of those style putters as well. These aren't doing much for me although I do like seeing them having the solid face vs. insert. I could play that 5.5 with some paint fill instead of that awful yellow. Other than the 5/5.5 though, the rest of them are gross.